If you do not wish to pay online, please send a cheque to: HOGG Treasurer, 61 Straight Road, Old Windsor, Berkshire, SL4 2RT. 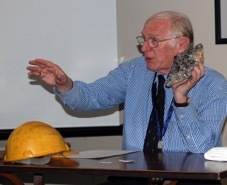 This one-day meeting has been convened under the auspices of Geological Society and History of Geology Group (HOGG) inassociation with the Geologists’ Association, The Ussher Society, The Russell Society and The Harrow and Hillingdon Geological Society. The contributions listed below reflect Bob’s contribution to mineralogical research, museum activities, earth science education, public outreach and the mineralogy of the Mendip Hills, the minerals and geology of Cornwall and Devon and the North of England.